DefendSearch.com alters browsing settings and forces you to use the new search engine. Reverse all changes to browse normally again. Detect the PUP and get rid of it automatically. DefendSearch.com is a browser-hijacking application which infiltrates the system via bundled software or third-party websites. DefendSearch is a browser hijacker which replaces your default homepage and search engine to http://defendsearch.com/?q=. It seems to attack Google Chrome; however, some other versions of the virus can affect other browsers as well. 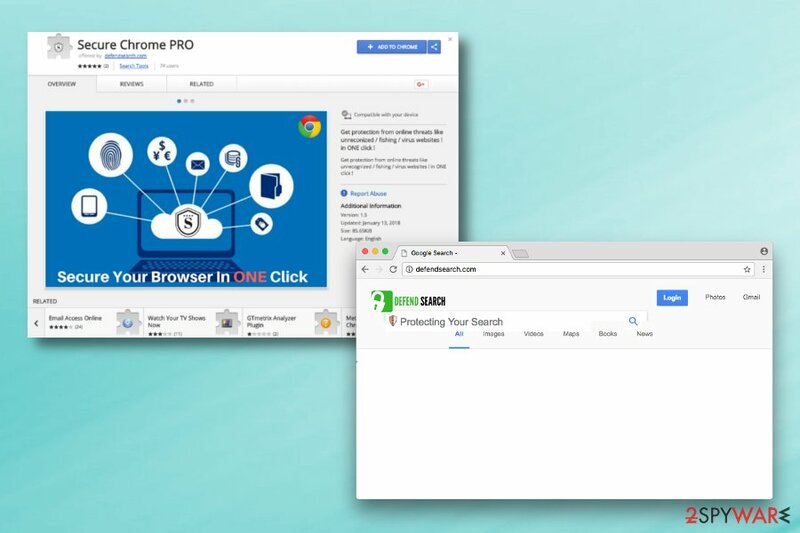 This shady search engine spreads as Secure Chrome Pro browser extension. Sometimes, users call this program DefendSearch virus due to its sneaky distribution technique through other software and the ability to perform a big variety of intruding activities. 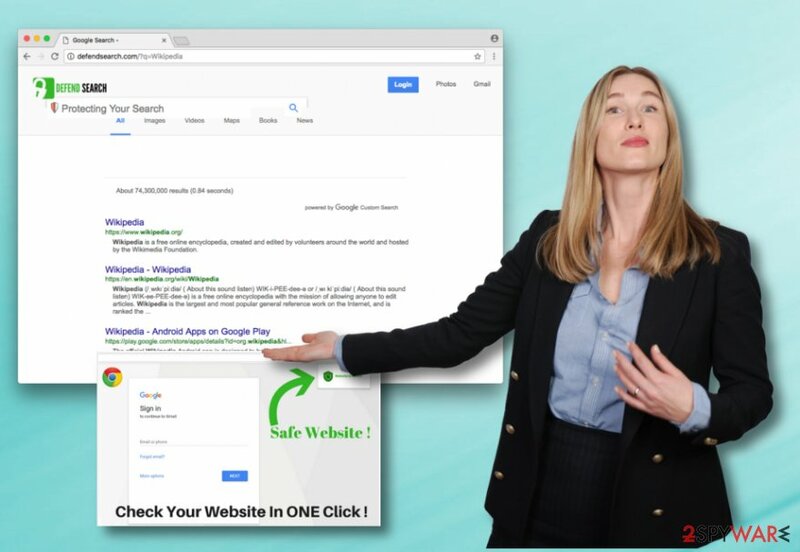 Once installed, the browser-hijacking application might bring even damaging consequences to your computer as you might accidentally land on a malicious website during the redirecting activity the potentially unwanted program might cause. The PUP might enter the system unnoticed. However, the first symptom of the DefendSearch hijack is clear – replaced homepage and default search engine to the new domain. If you do not get rid of these unwanted changes, you will be forced to use the new search engine which might show misleading search query results. Additionally, it can install browser helper objects that protect the hijacker and prevents from elimination. However, Defendsearch.com removal is needed due to the shady activities. This search engine is highly suspicious. According to the research, the hijacker might trigger redirects to the questionable websites that might be harmful or misleading. These redirecting problems might occur when users click on a search result link or out of nowhere. The main issue is that users cannot control this activity and avoid visiting potentially dangerous websites. Thus, their computers and privacy can be easily compromised. 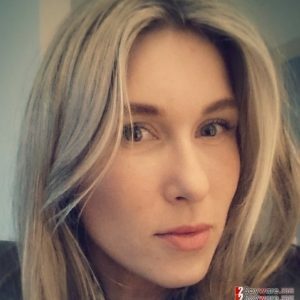 DefendSearch.com is a potentially unwanted application which causes dubious redirects, alters browser settings, and might provide advertising notifications. Additionally, so-called DefendSearch virus can display intrusive and misleading ads. Usually, they are based on user’s search queries, visited websites and similar browsing-related information. Unfortunately, the hijacker might be capable of tracking information and using it for advertising purposes. It goes without saying that you should not click them too. Such adverts often bring revenue from the cost-per-click technique. Users are advised to protect their browsers and browsing activity by uninstalling Secure Chrome Pro and other questionable components. The best way to remove DefendSearch.com virus is to scan the system with a reputable anti-malware program, such as Reimage. However, you can feel free to use any other reliable computer security software. Additionally, you can also get rid of DefendSearch.com together with related components manually. Our team has prepared detailed instructions at the end of the article. Please follow them carefully in order to succeed and get back to secure browsing. Clean all infected web browsers including Google Chrome, Mozilla Firefox, Microsoft Edge, Safari, Internet Explorer. 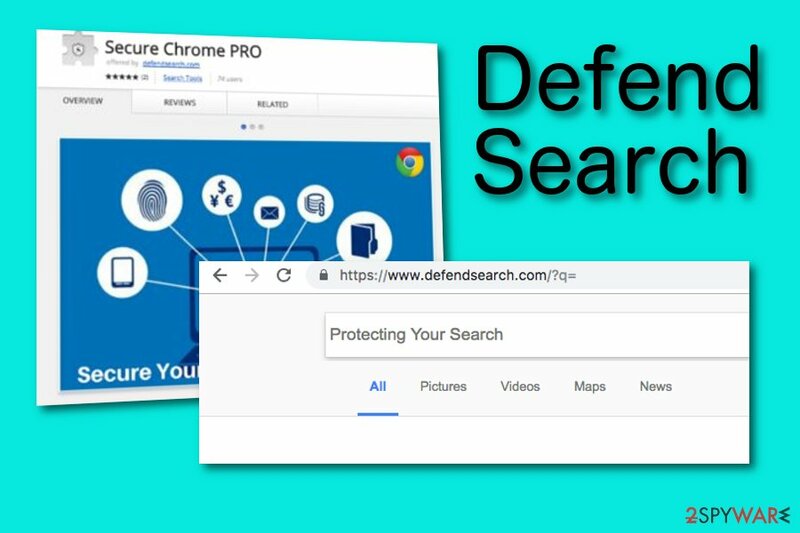 DefendSearch.com is a questionable search engine that spreads as Secure Chrome Pro browser extension. When downloading freeware or shareware, you have to be careful in order not to install unwanted programs like browser-hijacking applications or similar PUPs. These entries are added as optional components and can enter the system unnoticed if a user relies on Quick/Recommended settings. Unmark all pre-selected entries from additional third-party downloads. For further protection, you should purchase reliable computer security software which has a lot of protective features and functions. Make sure you keep the antivirus program always up-to-date and it will take care of your computer system properly. When you are browsing the web, you will feel safer as this program will block various threats from invading the PC. DefendSearch.com is a potentially unwanted program which can affect Windows or Mac operating systems. Defendsearch.com removal requires investigating the system and eliminating all cyber threats that might be related to them. The instructions below will show you where to look up for virus-related entries, and how to eliminate it entirely.However, if they seem complicated or time-consuming, there’s another solution. You can remove Defendsearch.com virus automatically with an updated anti-malware software. However, browser reset is still needed in order to get rid of tracking cookies and similar components. Open the web browsers that you often use and find all rogue components in their settings. Make sure you get rid of each PUP-related object, otherwise, the Defendsearch.com hijack might renew all rogue activities. Bringing browsers back to their previous states is a necessary thing to do if you want to browse the web fastly and effectively again. Moreover, keep in mind all browser hijacker avoiding tips which might be helpful in the future. Here, look for DefendSearch.com or any other recently installed suspicious programs. Wait until you see Applications folder and look for DefendSearch.com or any other suspicious programs on it. Now right click on every of such entries and select Move to Trash. When in the new window, check Delete personal settings and select Reset again to complete DefendSearch.com removal. Once these steps are finished, DefendSearch.com should be removed from your Microsoft Edge browser. Here, select DefendSearch.com and other questionable plugins. Click Remove to delete these entries. Now you will see Reset Firefox to its default state message with Reset Firefox button. Click this button for several times and complete DefendSearch.com removal. Uninstall Secure Chrome Pro extension and look up for other questionable entries. Then reset Google Chrome as explained below. Here, select DefendSearch.com and other malicious plugins and select trash icon to delete these entries. Click Reset to confirm this action and complete DefendSearch.com removal. Here, select Extensions and look for DefendSearch.com or other suspicious entries. Click on the Uninstall button to get rid each of them. Here, look at the Homepage field. If it was altered by DefendSearch.com, remove unwanted link and enter the one that you want to use for your searches. Remember to include the "http://" before typing in the address of the page. Now you will see a detailed dialog window filled with reset options. All of those options are usually checked, but you can specify which of them you want to reset. Click the Reset button to complete DefendSearch.com removal process. ^ Paul Cucu. Browser hijacker: Definition, Removal and Prevention Guide. Heidmal Security. Security guides. ^ Chris San Filippo. 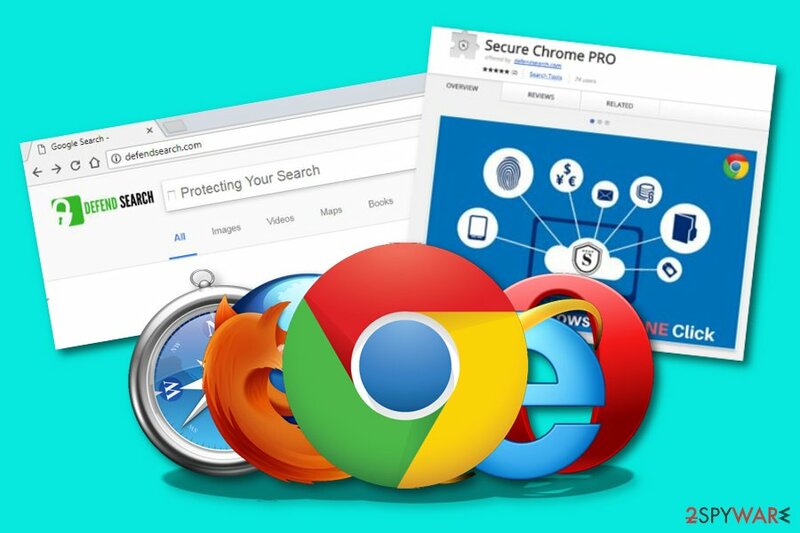 Tips to protect your browser from data hijacking. Hotspot Shield Blog. Covering online privacy and security. This entry was posted on 2019-01-11 at 08:52 and is filed under Browser Hijackers, Viruses. You can quickly scan the QR code with your mobile device and have DefendSearch.com manual removal instructions right in your pocket. How did you remove DefendSearch.com?